Jockey Tim Clark and trainer Chris Munce have combined to win the Magic Millions 3YO Guineas. 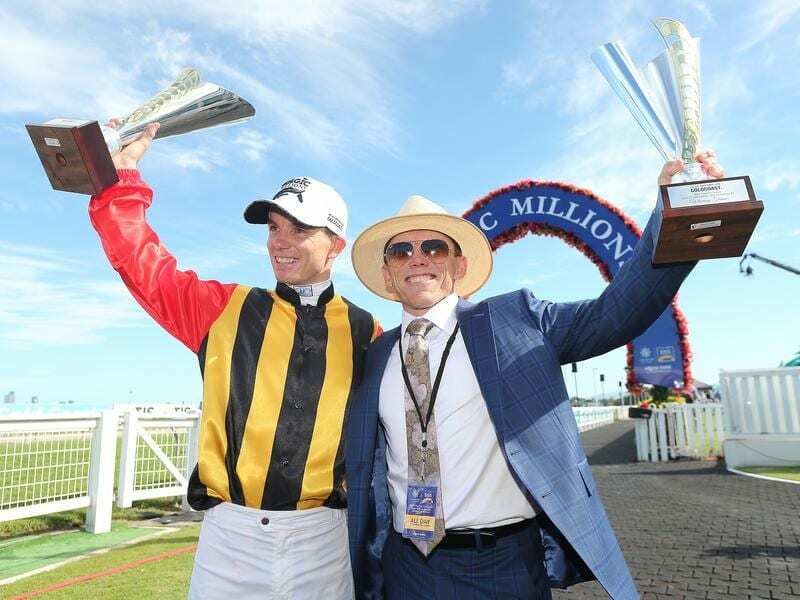 Boomsara has provided Chris Munce with a unique piece of Magic Millions history at the Gold Coast. As a jockey Munce won the Magic Millions 2YO Classic three times aboard Sunblazer, Excellerator and Dance Hero. On Saturday he carved out his own slice of history when he made the transition to successful trainer, courtesy of Boomsara’s thrilling victory in the Magic Millions 3YO Guineas. In a tense three-way finish Boomsara ($3.80) prevailed by a nose from Bondi ($10) with Outback Barbie, the $2.25 favourite, a nose away third. Apart from his Millions success as a jockey, Munce is one of a select group of riders to have won Australia’s four major Group One races – the Melbourne Cup, Caulfield Cup, Cox Plate and Golden Slipper. “As a rider I suppose you don’t realise or appreciate the hard work that goes into getting horses ready for a day like today,” Munce said. Jockey Tim Clark allowed Boomsara to cruise across to the lead and was impressed with the gelding’s determination when challenged in the straight. “I probably preferred to draw wide and let him stride across rather than be drawn in and have to bustle him,” he said. Munce paid tribute to jockey Damian Browne who was forced to relinquish the ride on Boomsara on Friday after undergoing emergency abdominal surgery. “I’m obviously feeling for him as he lies in a hospital bed. I would love for him to have ridden the horse today after riding him so well last start,” Munce said. A protest by James McDonald, who rode Outback Barbie, against Bondi for interference in the final stages of the Guineas was dismissed.